MediaTek is reportedly on the lookout for hardware partners to use its latest, AI-ready processors in high end, premium smartphones. Reports suggest that the company has been in talks with the likes of Apple, Samsung and Xiaomi to find application for its latest processors. The company is betting on increasing use of artificial intelligence and related tasks in smartphones, which it claims its processors are proficient at. MediaTek, however, has a major roadblock to overcome before it can find application in premium devices. The company’s products have always been hailed as cost-effective offerings in the mid-range price segment, but the perception that its chipsets don’t perform at par with rival Qualcomm’s processors has led to it losing ground. Qualcomm presently holds fort in terms of market share among mobile processors in premium devices, and its latest offerings claim superior performance for AI-related tasks. MediaTek, however, will hope to use its price advantage to attract more customers. The company has strong strategic pricing of its products, which helps it find implementation in offerings of new brands in particular. With Qualcomm eating into this market share as well, MediaTek will look to strike back. 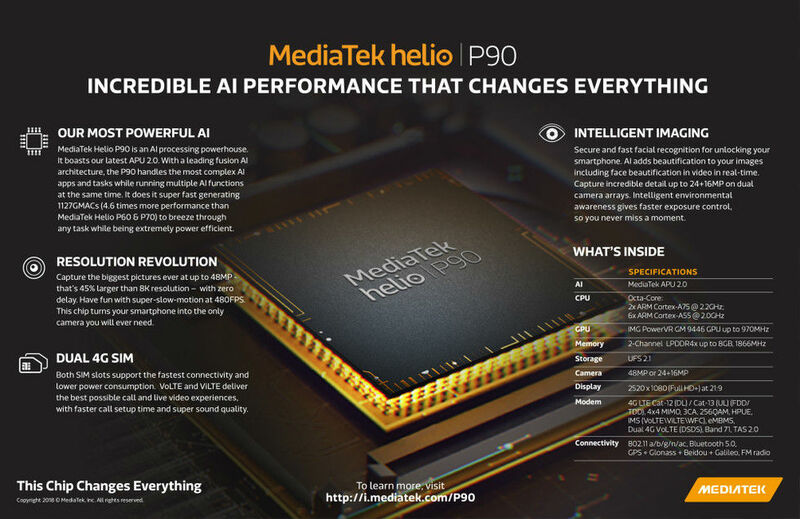 The company’s latest Helio P90 SoC is one such platform, which provides support for up to 48-megapixel image sensors and a dedicated AI compute platform. The processor will join the likes of the Helio P80 in attempting to find implementation in mid-range smartphones. AI-based tasks are steadily increasing in mainstream smartphones. Features such as advanced scene recognition and better UI features are becoming increasingly commonplace among smartphones by a host of phone manufacturers. MediaTek will look to aim at this segment itself to find customers, and would hope that it also gets to ride the next wave of mainstream phone technologies, which are set to take over everyday usage going forward in 2019.